The downside of having a slimmer add-in card is that there's less room for the internals. So the XU870 has one of the chunkiest-seeming antenna pods I've seen on a data card. First looks are deceptive, alongside Vodafone's PC Card 3G Broadband data card, it doesn't seem as large as it did when it was first taken out of the box. But it still pokes a fair way out of the side of your notebook. 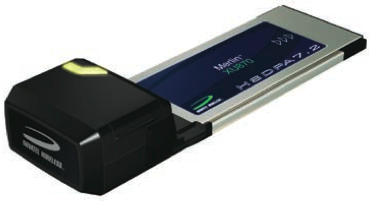 One advantage of ExpressCard is ease of removal. Just as the XU870 fixes into place with a click, so it's released with just a push against its spring-loaded locking mechanism, all without PC Card's little release button. This makes it much easier to take in and out than PC Card devices were. Out of the box, the XU870 ships with Windows software, but Novatel's website has Mac OS X software ready for downloading, along with full installation and usage instructions. Well, sort of. While the Mac package contains the driver needed to get operating system talking to hardware, it doesn't include the MobiLink application that Windows users can run to not only connect to the network but do useful things like send and answer SMS messages. Credit where it's due, though. Novatel does at least cater for Mac users, something so many other card makers fail to do. It also provides drivers and full instructions for getting the XU870 running on a Linux-based machine. I tried the XU870 out on a MacBook Pro. With the driver installed, getting the card up and running is just a matter of inserting a SIM into the card - there's a simple slide-in slot on the base of the XU870 - fitting it into the Mac and running Mac OS X's Internet Connect utility. With your chosen network's access codes entered, you're ready to connect. The XU870 will initiate GPRS, EDGE, 3G and HSDPA connections, opting for the fastest link at any given location. The card's antenna bulge has an angular LED indicating which mode you're connected by, and I got the yellow HSDPA indication almost immediately, with just a brief blue flash to indicate the presence of a 3G network. I used the device to download an 8.6MB file and achieved a download time of 47.19s - a speed of 1.46Mbps, which is as good a real-world throughput as I'd expect from an HSDPA network that delivers a theoretical maximum throughput of 1.8Mbps. In tests in London, not once did the card drop to GPRS or EDGE speeds, though at home it once briefly dipped into regular 3G. But it was only moments before the LED went yellow again. There's a flip-up panel on top of the XU870's bulge which, I presume, is an antenna extender - there's nothing in the User Guide about it, so far as I could see. It didn't improve the connection speed when I tried it, but it may help in borderline 3G/HSDPA areas. As ever, if you've tried the XU870 already, please post a comment and let us know how it works in such zones. Incidentally, the bulge has two rubber flaps on either side, one for show, the other to cover an external-antenna connector. Downloading more 'bitty' information - web pages, email, instant messages, that sort of thing - felt quick and responsive, certainly a broadband experience. Vodafone's network throttles JPEG files, alas, as do some other networks, which makes some sense for GPRS connections, but not HSDPA. While Vodafone's HSDPA network runs at up to 1.8Mbps, the technology is so specified as to allow upgrades to 3.6Mbps, 7.2Mbps and beyond. Novatel's device will run at up to 3.6Mbps, but the company promises it will be upgradeable to 7.2Mbps through a firmware update. The XU870 is certainly more expensive than the Vodafone-branded HSDPA products I've looked at, but in return you get a device that's not tethered to a specific network - you can swap in and out different carriers' SIMs as you see fit. 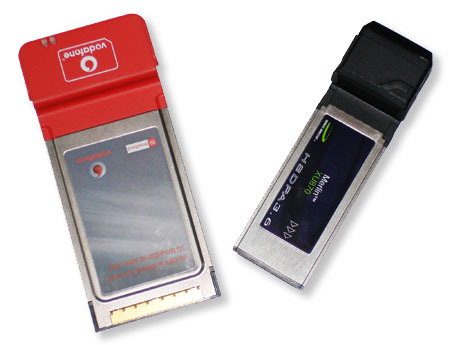 Crucially, the Novatel unit is one of the few - if not the only - ExpressCard 34 communications devices on the market today, making it the only real choice if you don't want to get your connectivity from Vodafone or you want a device that you can stow inside your laptop. Still, HSDPA access, whoever you get it from, doesn't come cheap. 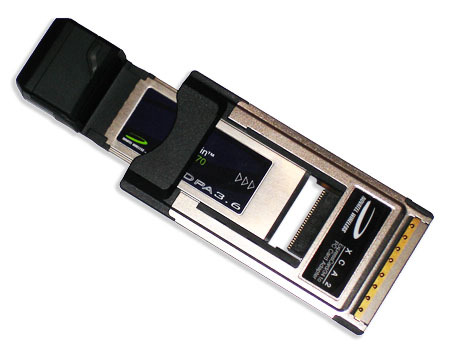 Neatly, Novatel bundles the XU870 with a PC Card adaptor, so the device isn't limited to ExpressCard 34 slots. My Windows machine is a PC Card-only laptop, and I had no problems using the XU870 with the adaptor. Downloading the same 8.6MB file as before I got a transfer speed of 1.76Mbps.